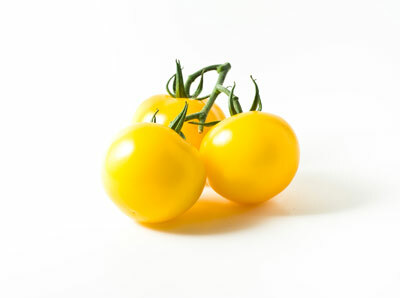 Orange and yellow tomatoes are perfect for cooking down into a luscious pasta sauce. The sweetness of the tomatoes balances out the spiciness of the Italian sausage resulting in an addictive plate of savoury, spicy pasta. Core and roughly dice the tomatoes. Place in a bowl, making sure to save the juices. Bring salted water to a boil. Add the pasta and cook according to the package. While the pasta is cooking, heat 1 tablespoon of olive oil in a large skillet over medium heat. Remove the sausage from the casing and crumble into the skillet, cooking and stirring until browned. Add the tomatoes, garlic and red pepper flakes and cook, stirring often until the tomatoes are soft. 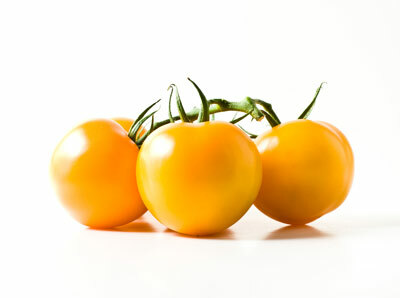 Press down on the tomatoes to release their juices. Simmer until sauce is thick (about 12-15 minutes). Remove the pan from the heat and set aside. When the pasta is cooked al dente, reserve 1 cup of pasta cooking water and drain pasta. Add the pasta to the skillet with the tomatoes and turn the heat back on to medium. Toss the pasta so the sauce coats each strand of pasta. 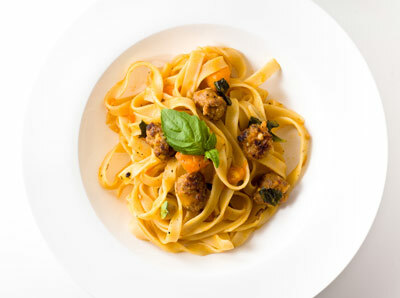 If the sauce is too thick or dry, add a small amount of pasta water until the desired consistency has been achieved. Add half of the torn basil and season with salt and pepper to taste. Serve immediately with the remaining basil sprinkled on top.